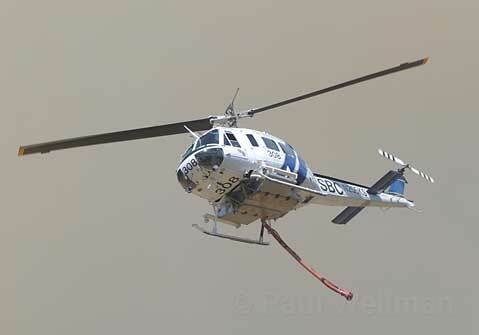 A helicopter making a drop on the Jesusita Fire. California’s wildfire season has begun, and Santa Barbara’s residents and firefighters are once again embroiled in a battle with surging flames and soaring smoke. The Jesusita Fire is now fully engulfing the mountains that frame the so-called “American Riviera” – much like they did last November, when the Tea Fire consumed more than 200 foothill homes, and last July, when the Gap Fire threatened thousands of homes above Goleta while burning nearly 10,000 acres. Winds are once again the biggest pusher of the flames, and they are shifting back and forth – they began blowing uphill, then shifted to down-canyon, but seem to be moving back uphill this afternoon. As of 5 p.m. on Tuesday, May 5, the fire had not yet burned any structures, but all the residents of San Roque Canyon and Mission Canyon have been evacuated. That affects about 1,200 homes, according to the County of Santa Barbara, which could mean that as many as 3,000 people may need shelter. The county also said that an evacuation warning has been extended, though it’s currently unclear exactly where that area is. As of 4:30 p.m., more than 150 acres had burned and about 70 fire engines from 14 strike teams were fighting the fire, including squads that were stationed at individual homes. The County of Santa Barbara said that another 20 strike teams had already been requested. The flames were within a mile of the closest structure. Officials say that massive power outages might occur. 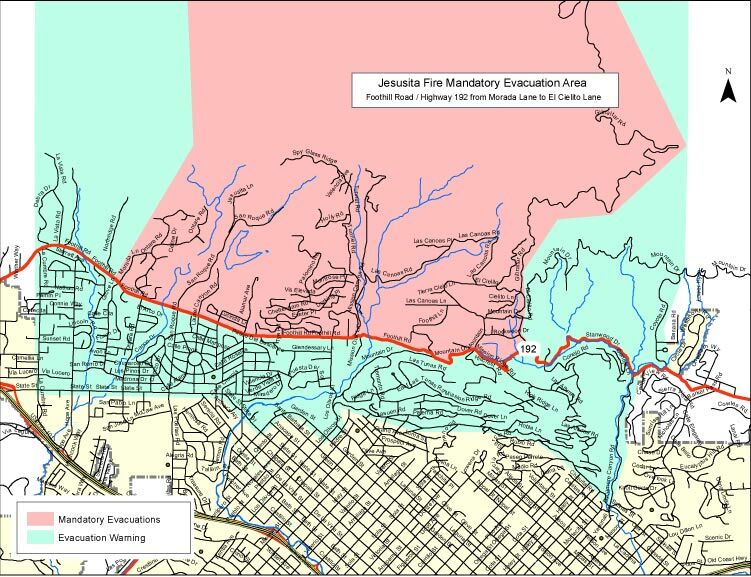 Meanwhile, since the fire started around 1:45 p.m. near the popular Jesusita Trail and gunshots were reportedly heard in the area around that time, there is suspicion that the Jesusita Fire may be human-caused. The Independent‘s correspondent Ray Ford, an expert and author on wildfires in Santa Barbara County, was last heard from while atop Spyglass Ridge Road, one of the first places to be evacuated. At about 4:35 p.m., Ford reported that he was at the last house on the ridge, looking into San Roque Canyon. Plumes of smoke were climbing to 1,000 or more feet, indicating heavy brush burning, and fire engines were stationed at each house on the street, awaiting a big battle with the flames. Around 4:45 p.m, however, reports came across the scanner airwaves that the winds had already started to shift back up-canyon. At about 5 p.m., Meagher was able to speak with Mike Deponce, a fire captain with the City of Santa Barbara who gave a weather report that suggested northwesterly winds for the next three days. Humidity also looks favorable at about 35 to 40 percent; the teens and twenties are when wildfires get “really scary,” said Deponce. Deponce also told Meagher that the firefighting teams were planning to transition into management mode tomorrow, which indicates a lot of personnel already on the way. That includes tankers, which are expected soon. The mandatory evacuations were ordered by the City and County of Santa Barbara just after 4 p.m. and apply to all residents who live north of Highway 192/Foothill Road and between Morada and Ontare roads on the west and El Cielito/Gibraltar roads on the east. In short, all of San Roque and Mission canyons, all the way up to East Camino Cielo. The Sycamore Canyon Road gate has been opened for residents evacuating that route. According to The Independent‘s copy editor Jean Yamamura, authorities are not letting anyone through their roadblocks, and Yamamura has heard of every reason, from sick pets to elderly relatives. “They are absolutely not letting anyone through,” she said while at the roadblock where Highway 192 hits Mission Ridge Road, on the back of the Riviera. Yamamura, who lives in Mission Canyon, experienced many traffic delays in trying to get home, and also witnessed residents getting very angry with authorities who would not let them through. A scanner report suggested that an altercation may have also taken place near Montrose Place and Tunnel Road. Meanwhile, Highway 192 is officially closed from Highway 154 to Mission Canyon Road. For residents who have evacuated, the Santa Barbara chapter of the Red Cross has opened a shelter at the First Presbyterian Church, 21 East Constance Avenue, just off State Street. Call 687-1331 or see sbredcross.org. People with large animals can bring them to Earl Warren Showgrounds for temporary housing. Small; animals can be housed at the Humane Society on Patterson Road. Call 681-4332. For more info, see independent.com/jesusita or tune into KCSB 91.9 FM. Readers are encouraged to submit their own stories and photographs to fire@independent.com.